Longchen Nyingtik (Tib. ཀློང་ཆེན་སྙིང་ཐིག་, Wyl. klong chen snying thig) — a Nyingma cycle of teachings and practice, which was discovered by Jikmé Lingpa as mind terma. While Guru Rinpoche was visiting Tibet…he conferred the Longchen Nyingtik teachings on King Trisong Detsen, Khandro Yeshe Tsogyal, and Vairochana… He gave prophetic empowerments by saying that the teachings would be discovered by Jikmé Lingpa, an incarnation (tulku) of King Trisong Detsen. So centuries later, when the prophetic empowerments of Guru Rinpoche ripened and the favorable circumstances came to fruition, the concealed Longchen Nyingtik teachings were accordingly awakened in the enlightened mind of Jikmé Lingpa as mind ter. In the evening of the twenty-fifth day of the tenth month of the Fire Ox year of the thirteenth Rabjung cycle (1757), Jikmé Lingpa went to bed with an unbearable devotion to Guru Rinpoche in his heart; a stream of tears of sadness continuously wet his face because he was not in Guru Rinpoche’s presence, and unceasing words of prayers kept singing in his breath. In this vision, the wisdom dakinis gave Jikmé Lingpa a casket containing five yellow scrolls and seven crystal beads. One of the scrolls contained the prophetic guide of Longchen Nyingtik, called Nechang Thukkyi Drombu. At the instruction of a dakini, he ate the yellow scrolls and crystal beads, and all the words and meaning of the Longchen Nyingtik terma were awakened in his mind. The Longchen Nyingtik terma consists of tantric sadhanas and teachings. The Nyingtik teachings are the innermost secret teachings of Dzogchen. The Dzogchen teachings were revealed to Prahevajra (Tib. Garab Dorje) by Vajrasattva, and passed down through an unbroken lineage to present day masters. Within the Dzogchen teachings, there are three categories of teachings suitable to students of different capacity. The Nyingtik is the innermost secret cycle of teachings of the Category of Pith Instructions; this cycle is the most direct approach for students of the highest capacity. In the fourteenth century in Tibet, the great master Longchen Rabjam became the lineage holder of both of these Nyingtik traditions, and wrote a commentary on each tradition. Longchen Rabjam (1308-1364), also known as Longchenpa, was one of the greatest Dzogchen masters in the Nyingma tradition, and amongst the most brilliant and original writers in Tibetan Buddhist literature. He brought together into a cohesive system the teachings of Vima Nyingtik and Khandro Nyingtik, on which he wrote the ‘Three Yangtik’ or Inner Essencess. Four centuries later, Jikmé Lingpa was tremendously inspired by the teachings of Longchenpa. After Jikmé Lingpa discovered the terma of Longchen Nyingtik (which included tantric sadhanas and teachings) he entered into a three-year retreat in the caves of Chimphu in which he fervently invoked Longchenpa with a Guru Yoga he had composed. Longchenpa appeared to him in three visions, through which he received the blessing and transmission of the wisdom body, speech and mind of Longchenpa, empowering him with the responsibility of preserving the meaning of the teachings of Longchenpa, and of spreading them. As a result, Jikmé Lingpa’s mind became one with the wisdom mind of Longchenpa. In this way, Jikmé Lingpa became the lineage holder of Longchenpa’s teachings on the Vima Nyingtik and Khandro Nyingtik. 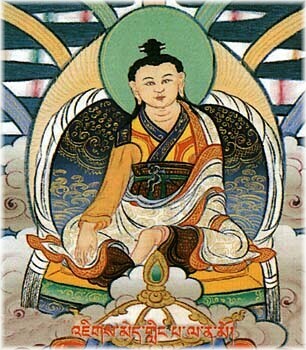 Jikmé Lingpa was a reincarnation of both King Trisong Detsen and Vimilamitra. Therefore, the Nyingtik teachings of these two major lineages flowed together in Jikmé Lingpa. The Longchen Nyingtik lineage includes both the terma of Longchen Nyingtik discovered by Jikmé Lingpa, and teachings of Longchen Rabjam on Vima Nyingtik and Khandro Nyingtik that were revealed to Jikmé Lingpa in a series of visions. Most of the rituals and mudras of the Longchen Nyingtik tradition find their source in the Lama Gongdü, on which Jikmé Lingpa wrote his famous commentary, called a Detailed Commentary on the Lama Gongdü. The Lama Gondü is therefore held in high regard. The cycle of the Longchen Nyingtik is composed of many sections. It includes the preliminary and main practices, the development and completion stages, and, most important, the practice of Ati Yoga, or Dzogchen. It thus constitutes a complete path to enlightenment. In the Longchen Nyingtik tradition, the preliminary (or ngöndro) practices are commonly referred to as the Longchen Nyingtik Ngöndro. After completing the ngondro, training in the development and completion stages is done through sadhana practices such as Rigdzin Dupa. Traditionally, a student trains in a series of three sadhanas known as the Three Roots. Finally, if the student is sufficiently prepared, a qualified teacher may give the students instructions in Dzogchen, which focus on the direct realization of the nature of mind. A thangka showing the deities of Longchen Nyingtik, including the lama Rigdzin Düpa, the yidam Palchen Düpa, the khandro Yumka Dechen Gyalmo, along with Dukngal Rangdrol, Takhyung Barwa, Senge Dongma and the protective deities. Some of the main lineage holders of the Longchen Nyingtik lineage are listed below. There are many present-day masters of the Longchen Nyingtik lineage; the list below includes some of the teachers most familiar to Rigpa students. ↑ Masters of Meditation and Miracles, by Tulku Thondup, pages 43-44. ↑ Masters of Meditation and Miracles, by Tulku Thondup, pages 122-123. ↑ Hidden Teachings of Tibet, An Explanation of the Terma Tradition of Tibetan Buddhism, by Tulku Thondup, pages 122-123. ↑ Masters of Meditation and Miracles, by Tulku Thondup, page 33. ↑ The Wish-Fulfilling Jewel: The Practice of Guru Yoga According to the Longchen Nyingtik Tradition, by Dilgo Khyentse, Shambhala Publications, page 8. This page was last edited on 27 September 2018, at 04:33.